Onychomycosis, also known as tinea unguium, is a fungal infection of the nail. Symptoms may include white or yellow nail discoloration, thickening of the nail, and separation of the nail from the nail bed. Toenails or fingernails may be affected, but it is more common for toenails to be affected. Complications may include cellulitis of the lower leg. A number of different types of fungus can cause onychomycosis including dermatophytes and Fusarium. Risk factors include athlete's foot, other nail diseases, exposure to someone with the condition, peripheral vascular disease, and poor immune function. The diagnosis is generally suspected based on the appearance and confirmed by laboratory testing. Onychomycosis does not necessarily require treatment. The antifungal medication, terbinafine, taken by mouth appears to be the most effective but is associated with liver problems. Trimming the affected nails when on treatment also appears useful. There is a ciclopirox-containing nail polish, but it does not work as well. The condition returns in up to half of cases following treatment. Not using old shoes after treatment may decrease the risk of recurrence. It occurs in about 10 percent of the adult population. Older people are more frequently affected. Males are affected more often than females. Onychomycosis represents about half of nail disease. It was first determined to be the result of a fungal infection in 1853 by Georg Meissner. The most common symptom of a fungal nail infection is the nail becoming thickened and discoloured: white, black, yellow or green. As the infection progresses the nail can become brittle, with pieces breaking off or coming away from the toe or finger completely. If left untreated, the skin underneath and around the nail can become inflamed and painful. There may also be white or yellow patches on the nailbed or scaly skin next to the nail, and a foul smell. There is usually no pain or other bodily symptoms, unless the disease is severe. 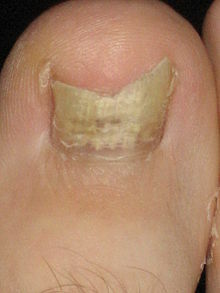 People with onychomycosis may experience significant psychosocial problems due to the appearance of the nail, particularly when fingers – which are always visible – rather than toenails are affected.Dermatophytids are fungus-free skin lesions that sometimes form as a result of a fungus infection in another part of the body. This could take the form of a rash or itch in an area of the body that is not infected with the fungus. Dermatophytids can be thought of as an allergic reaction to the fungus. The causative pathogens of onychomycosis are all in the fungus kingdom and include dermatophytes, Candida (yeasts), and nondermatophytic molds. Dermatophytes are the fungi most commonly responsible for onychomycosis in the temperate western countries; while Candida and nondermatophytic molds are more frequently involved in the tropics and subtropics with a hot and humid climate. Trichophyton rubrum is the most common dermatophyte involved in onychomycosis. Other dermatophytes that may be involved are T. interdigitale, Epidermophyton floccosum, T. violaceum, Microsporum gypseum, T. tonsurans, and T. soudanense. A common outdated name that may still be reported by medical laboratories is Trichophyton mentagrophytes for T. interdigitale. The name T. mentagrophytes is now restricted to the agent of favus skin infection of the mouse; though this fungus may be transmitted from mice and their danders to humans, it generally infects skin and not nails. Other causative pathogens include Candida and nondermatophytic molds, in particular members of the mold genus Scytalidium (name recently changed to Neoscytalidium), Scopulariopsis, and Aspergillus. Candida species mainly cause fingernail onychomycosis in people whose hands are often submerged in water. Scytalidium mainly affects people in the tropics, though it persists if they later move to areas of temperate climate. Other molds more commonly affect people older than 60 years, and their presence in the nail reflects a slight weakening in the nail's ability to defend itself against fungal invasion. Aging is the most common risk factor for onychomycosis due to diminished blood circulation, longer exposure to fungi, and nails which grow more slowly and thicken, increasing susceptibility to infection. Nail fungus tends to affect men more often than women, and is associated with a family history of this infection. Other risk factors include perspiring heavily, being in a humid or moist environment, psoriasis, wearing socks and shoes that hinder ventilation and do not absorb perspiration, going barefoot in damp public places such as swimming pools, gyms and shower rooms, having athlete's foot (tinea pedis), minor skin or nail injury, damaged nail, or other infection, and having diabetes, circulation problems, which may also lead to lower peripheral temperatures on hands and feet, or a weakened immune system. The diagnosis is generally suspected based on the appearance and confirmed by laboratory testing. The four main tests are a potassium hydroxide smear, culture, histology examination, and polymerase chain reaction. The sample examined is generally nail scrapings or clippings. These being from as far up the nail as possible. Nail plate biopsy with periodic acid-Schiff stain appear more useful than culture or direct KOH examination. To reliably identify nondermatophyte molds, several samples may be necessary. Distal subungual onychomycosis is the most common form of tinea unguium and is usually caused by Trichophyton rubrum, which invades the nail bed and the underside of the nail plate. White superficial onychomycosis (WSO) is caused by fungal invasion of the superficial layers of the nail plate to form "white islands" on the plate. It accounts for around 10 percent of onychomycosis cases. In some cases, WSO is a misdiagnosis of "keratin granulations" which are not a fungus, but a reaction to nail polish that can cause the nails to have a chalky white appearance. A laboratory test should be performed to confirm. Proximal subungual onychomycosis is fungal penetration of the newly formed nail plate through the proximal nail fold. It is the least common form of tinea unguium in healthy people, but is found more commonly when the patient is immunocompromised. Candidal onychomycosis is Candida species invasion of the fingernails, usually occurring in persons who frequently immerse their hands in water. This normally requires the prior damage of the nail by infection or trauma. In many cases of suspected nail fungus there is actually no fungal infection, but only nail deformity. To avoid misdiagnosis as nail psoriasis, lichen planus, contact dermatitis, nail bed tumors such as melanoma, trauma, or yellow nail syndrome, laboratory confirmation may be necessary. Other conditions that may appear similar to onychomycosis include: psoriasis, normal aging, yellow nail syndrome, and chronic paronychia. A person's foot with a fungal nail infection ten weeks into a course of terbinafine oral medication. Note the band of healthy (pink) nail growth behind the remaining infected nails. Most treatments are with antifungal medications either topically or by mouth. Avoiding use of antifungal therapy by mouth (e.g. terbinafine) in persons without a confirmed infection is recommended because of the possible side effects of that treatment. Topical agents include ciclopirox nail paint, amorolfine, and efinaconazole. Some topical treatments need to be applied daily for prolonged periods (at least 1 year). Topical amorolfine is applied weekly. Topical ciclopirox results in a cure in 6% to 9% of cases; amorolfine might be more effective. Ciclopirox when used with terbinafine appears to be better than either agent alone. Medications that may be taken by mouth include terbinafine (76% effective), itraconazole (60% effective) and fluconazole (48% effective). They share characteristics that enhance their effectiveness: prompt penetration of the nail and nail bed, and persistence in the nail for months after discontinuation of therapy. Ketoconazole by mouth is not recommended due to side effects. Oral terbinafine is better tolerated than itraconazole. For superficial white onychomycosis, systemic rather than topical antifungal therapy is advised. Chemical (keratolytic) or surgical debridement of the affected nail appears to improve outcomes. As of 2014 evidence for laser treatment is unclear as the evidence is of low quality and varies by type of laser. Tea tree oil is not recommended as a treatment, since it is not effective. However, according to a 2015 study, the cost in the United States of testing with the periodic acid–Schiff stain (PAS) was about $148. Even if the cheaper KOH test is used first and the PAS test is used only if the KOH test is negative, there is a good chance that the PAS will be done (because of either a true or a false negative with the KOH test). But the terbinafine treatment costs only $10 (plus an additional $43 for liver function tests). In conclusion the authors say that terbinafine has a relatively benign adverse effect profile, with liver damage very rare, so it makes more sense cost-wise for the dermatologist to prescribe the treatment without doing the PAS test. (Another option would be to prescribe the treatment only if the potassium hydroxide test is positive, but it gives a false negative in about 20% of cases of fungal infection.) On the other hand, as of 2015 the price of topical (non-oral) treatment with efinaconazole was $2307 per nail, so testing is recommended before prescribing it. Following effective treatment, recurrence is common (10–50%). Nail fungus can be painful and cause permanent damage to nails. It may lead to other serious infections if the immune system is suppressed due to medication, diabetes or other conditions. The risk is most serious for people with diabetes and with immune systems weakened by leukemia or AIDS, or medication after organ transplant. Diabetics have vascular and nerve impairment, and are at risk of cellulitis, a potentially serious bacterial infection; any relatively minor injury to feet, including a nail fungal infection, can lead to more serious complications. Infection of the bone is another rare complication. A 2003 survey of diseases of the foot in 16 European countries found onychomycosis to be the most frequent fungal foot infection and estimates its prevalence at 27%. Prevalence was observed to increase with age. In Canada, the prevalence was estimated to be 6.48%. Onychomycosis affects approximately one-third of diabetics and is 56% more frequent in people suffering from psoriasis. The term is from Greek ὄνυξ onyx "nail", μύκης mykēs "fungus", and the suffix -ωσις -ōsis "functional disease". Research suggests that fungi are sensitive to heat, typically 40–60 °C (104–140 °F). The basis of laser treatment is to try to heat the nail bed to these temperatures in order to disrupt fungal growth. As of 2013 research into laser treatment seems promising. There is also ongoing development in photodynamic therapy, which uses laser or LED light to activate photosensitisers that eradicate fungi. ^ a b Rapini, Ronald P.; Bolognia, Jean L.; Jorizzo, Joseph L. (2007). Dermatology: 2-Volume Set. St. Louis: Mosby. p. 1135. ISBN 1-4160-2999-0. ^ a b c d e f g h i j k l m n o p q r s t u v w x y z aa ab ac ad ae af Westerberg DP, Voyack MJ (Dec 1, 2013). "Onychomycosis: current trends in diagnosis and treatment". American Family Physician. 88 (11): 762–70. PMID 24364524. ^ a b c d e f g h i j k l m n o p "Onychomycosis – Dermatologic Disorders". Merck Manuals Professional Edition. February 2017. Retrieved 2 June 2018. ^ Kreijkamp-Kaspers, S; Hawke, K; Guo, L; Kerin, G; Bell-Syer, SE; Magin, P; Bell-Syer, SV; van Driel, ML (14 July 2017). "Oral antifungal medication for toenail onychomycosis". The Cochrane Database of Systematic Reviews. 7: CD010031. doi:10.1002/14651858.CD010031.pub2. PMID 28707751. ^ Rigopoulos, Dimitris; Elewski, Boni; Richert, Bertrand (2018). Onychomycosis: Diagnosis and Effective Management. John Wiley & Sons. ISBN 9781119226505. ^ Szepietowski JC, Reich A (September 2008). "Stigmatisation in onychomycosis patients: a population-based study". Mycoses. 52 (4): 343–9. doi:10.1111/j.1439-0507.2008.01618.x. PMID 18793262. ^ Chi CC, Wang SH, Chou MC (2005). "The causative pathogens of onychomycosis in southern Taiwan". Mycoses. 48 (6): 413–20. doi:10.1111/j.1439-0507.2005.01152.x. PMID 16262878. ^ Velasquez-Agudelo, V; Cardona-Arias, JA (22 February 2017). "Meta-analysis of the utility of culture, biopsy, and direct KOH examination for the diagnosis of onychomycosis". BMC Infectious Diseases. 17 (1): 166. doi:10.1186/s12879-017-2258-3. PMC 5320683. PMID 28222676. ^ Shemer A, Davidovici B, Grunwald MH, Trau H, Amichai B (2009). "New criteria for the laboratory diagnosis of nondermatophyte moulds in onychomycosis". The British Journal of Dermatology. 160 (1): 37–9. doi:10.1111/j.1365-2133.2008.08805.x. PMID 18764841. ^ James, William D.; Berger, Timothy G. (2006). Andrews' Diseases of the Skin: clinical Dermatology. Saunders Elsevier. ISBN 0-7216-2921-0. ^ "AAPA". Cmecorner.com. Retrieved 2010-08-05. ^ a b American Academy of Dermatology (February 2013), "Five Things Physicians and Patients Should Question", Choosing Wisely: an initiative of the ABIM Foundation, American Academy of Dermatology, retrieved 5 December 2013 . Which cites:* Roberts DT, Taylor WD, Boyle J (2003). "Guidelines for treatment of onychomycosis" (PDF). The British Journal of Dermatology. 148 (3): 402–410. doi:10.1046/j.1365-2133.2003.05242.x. PMID 12653730. ^ a b Mikailov A, Cohen J, Joyce C, Mostaghimi A (2015). "Cost-effectiveness of Confirmatory Testing Before Treatment of Onychomycosis". JAMA Dermatology: 1–6. doi:10.1001/jamadermatol.2015.4190. PMID 26716567. ^ Hall, Brian (2012). Sauer's Manual of Skin Diseases (10 ed.). Lippincott Williams & Wilkins. p. Chapter 33. ISBN 9781451148688. ^ Rodgers P, Bassler M (2001). "Treating onychomycosis". Am Fam Physician. 63 (4): 663–72, 677–8. PMID 11237081. ^ a b c Crawford F, Hollis S (2007). Crawford, Fay (ed.). "Topical treatments for fungal infections of the skin and nails of the foot". Cochrane Database Syst Rev (3): CD001434. doi:10.1002/14651858.CD001434.pub2. PMID 17636672. ^ Gupta AK, Paquet M (2014). "Efinaconazole 10% nail solution: a new topical treatment with broad antifungal activity for onychomycosis monotherapy". Journal of cutaneous medicine and surgery. 18 (3): 151–5. PMID 24800702. ^ Elewski, BE (July 1998). "Onychomycosis: pathogenesis, diagnosis, and management". Clinical Microbiology Reviews. 11 (3): 415–29. PMC 88888. PMID 9665975. ^ Elewski, BE; Hay, RJ (August 1996). "Update on the management of onychomycosis: highlights of the Third Annual International Summit on Cutaneous Antifungal Therapy". Clinical Infectious Diseases. 23 (2): 305–13. doi:10.1093/clinids/23.2.305. PMID 8842269. ^ "Nizoral (ketoconazole) Oral Tablets: Drug Safety Communication - Prescribing for Unapproved Uses including Skin and Nail Infections Continues; Linked to Patient Death". FDA. 19 May 2016. Retrieved 20 May 2016. ^ Haugh M, Helou S, Boissel JP, Cribier BJ (2002). "Terbinafine in fungal infections of the nails: a meta-analysis of randomized clinical trials". Br. J. Dermatol. 147 (1): 118–21. doi:10.1046/j.1365-2133.2002.04825.x. PMID 12100193. ^ Baran R, Faergemann J, Hay RJ (2007). "Superficial white onychomycosis—a syndrome with different fungal causes and paths of infection". J. Am. Acad. Dermatol. 57 (5): 879–82. doi:10.1016/j.jaad.2007.05.026. PMID 17610995. ^ Bristow, IR (2014). "The effectiveness of lasers in the treatment of onychomycosis: a systematic review". Journal of foot and ankle research. 7: 34. doi:10.1186/1757-1146-7-34. PMC 4124774. PMID 25104974. ^ "Laser Therapy for Onychomycosis: Fact or Fiction?". Journal of Fungi. 1: 44–54. 2015. doi:10.3390/jof1010044. ^ Burzykowski T, Molenberghs G, Abeck D, Haneke E, Hay R, Katsambas A, Roseeuw D, van de Kerkhof P, van Aelst R, Marynissen G (2003). "High prevalence of foot diseases in Europe: Results of the Achilles Project". Mycoses. 46 (11–12): 496–505. doi:10.1046/j.0933-7407.2003.00933.x. PMID 14641624. ^ Verma S, Heffernan MP (2008). Superficial fungal infection: Dermatophytosis, onychomycosis, tinea nigra, piedra. In K Wolff et al., eds., Fitzpatrick's Dermatology in General Medicine, 7th ed., vol 2, pp. 1807–1821. New York: McGraw Hill. ^ Vender RB, Lynde CW, Poulin Y (2006). "Prevalence and epidemiology of onychomycosis". Journal of cutaneous medicine and surgery. 10 Suppl 2: S28–S33. doi:10.2310/7750.2006.00056. PMID 17204229. ^ Gupta AK, Konnikov N, MacDonald P, Rich P, Rodger NW, Edmonds MW, McManus R, Summerbell RC (1998). "Prevalence and epidemiology of toenail onychomycosis in diabetic subjects: A multicentre survey". The British Journal of Dermatology. 139 (4): 665–671. doi:10.1046/j.1365-2133.1998.02464.x. PMID 9892911. ^ Gupta AK, Lynde CW, Jain HC, Sibbald RG, Elewski BE, Daniel CR, Watteel GN, Summerbell RC (1997). "A higher prevalence of onychomycosis in psoriatics compared with non-psoriatics: A multicentre study". The British Journal of Dermatology. 136 (5): 786–789. doi:10.1046/j.1365-2133.1997.6771624.x. PMID 9205520. ^ ὄνυξ, μύκης. Liddell, Henry George; Scott, Robert; A Greek–English Lexicon at the Perseus Project. ^ "Device-based Therapies for Onychomycosis Treatment". Retrieved 23 December 2012.